Happy Sunday, everyone! When I check the calendar I cannot believe that today marks the fact that 2013 is half over… time flies! Summer arrived a little over a week ago and with it come fond memories from last year. I was about to embark on a fantastic photography workshop with a very knowledgeable photographer, John Perret of Saskatoon. I was excited about photography for some time but John ignited a passion I did not know I had in me… except for textile art and teaching. After the July 2012 workshop I became a faithful camera carrier, and those readers that have been followers for some time can attest to my travel reports across central and Atlantic Canada late last summer. And then… Winter came and the decision to upgrade to a full frame camera. The camera arrived and with it the deep freeze… my enthusiasm was put on ice, involuntarily. In April 2013 I had a date with the sun in Santa Fe, and since then I have not looked back! We headed out by 6:30 pm, picnic supper in hand, in search of a good location without much light pollution. Last November I took Aurora Borealis images right in our community. At the time I was very happy with the outcome, but I have done further reading and additional research, and now I am not too excited about them anymore. The homes across the lake are fully illuminated and in the summer the reflection in the water would amplify the light. Our first stop was in a protected nature area managed by Ducks Unlimited… it was truly untouched – and swarming with mosquitoes. We forged on to Lovering Lakes, near Chamberlain, SK and a 20 minute drive from home. The sunset was spectacular but nothing could predict the natural light display after it became completely dark around 11:15 pm. Our cameras really got a workout and the small slideshow above will provide an idea how spectacular the Aurora Borealis really was. Why is my post titled: Decision, Decisions…? I have reached a preliminary decision for the summer months: I am going to publish two posts per week. Personal and social media research has revealed that most readers visit blogs from Monday through Thursday. With that fact in mind I will be posting every Monday and Wednesday. This does not mean I will rest on my laurels… as the saying goes. You may recall: I maintain two other blogs that are not textile related. My inspirational photo and quote per day blog can be found here, and my relatively new travel blog website is found here. I am planning to post one travel related post per week over the next two months, with more following in the fall while visiting Europe, the US and Northern Canada. New followers on these blogs are always welcome! Meanwhile, I will spend much needed time in the studio as well. I am not deserting you – I am just regrouping for the summer! Wishing you a great Sunday! And happy long weekend, if you live in Canada! 30 Jun	This entry was published on June 30, 2013 at 6:23 am. 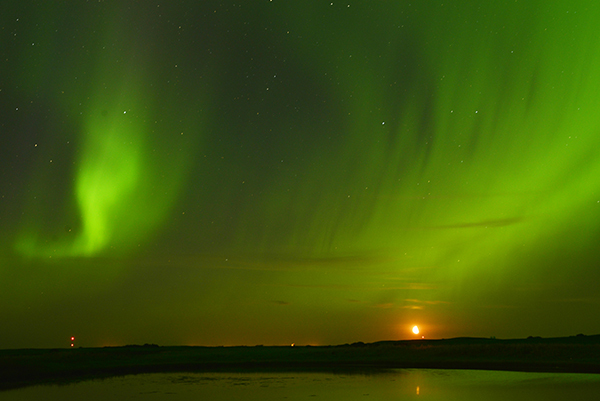 It’s filed under Creativity Update, Journaling, Landscape photography and tagged all in a day's work, Aurora Borealis, blogging, picture a day and inspirational quote, reevaluating time, Regina Photo Club, South Western Saskatchewan night sky, studio practice, travel blog. Bookmark the permalink. Follow any comments here with the RSS feed for this post. Another question, did you use a filter or was this the true colour? I didn’t use a filter. I set the camera to manual, increased my ISO and worked with exposure times and aperture. The vivid color are not usually visible to the eye – but the camera lens captures it like magic. I’m thinking that truly this an inspiration for a whole new fibre art display, what a great series you could do with these colours and the movement of the light. Anna those are fabulous! Maybe a book is in the making?! Paula, it’s a little early to think about a book with my photos. For now I am just enjoying the process. Glad you enjoyed the images. Beautiful Photos! Amazing light show!